Revamp your traditional Halloween jack-o-lantern display by adding these illuminated pumpkin lanterns to your doorstep this fall. These pumpkin lanterns are an easy Halloween party decoration sure to impress your guests, and the festive do-it-yourself decorations will last even after Halloween has come and gone. Combining the best of carved pumpkins and embellished paper luminaries, these Halloween lanterns add a warm porch welcome for your Halloween party. These classic fall-themed pumpkin templates bring a festive touch to your doorstep with glowing crafty luminaries. A fall family favorite, tricky pumpkin carving is made easier with our premade free printable leaf designs. Looking for more Halloween pumpkin designs? Here are our best pumpkin carving design ideas for you and your family. Leftover pumpkins? 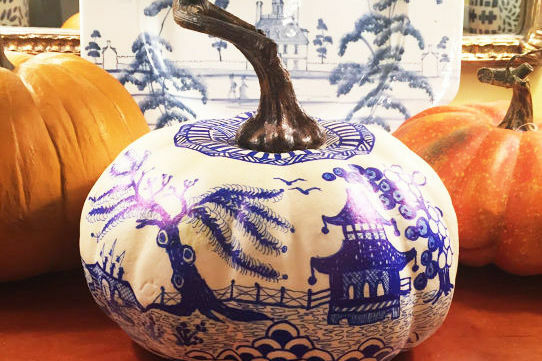 Try making a festive fall pumpkin centerpiece. Not a fan of pumpkin carving? Skip the scalpel and try these DIY glowing mason jar jack-o-lanterns. Follow these simple steps to create a fall display for an outdoor welcome. As always, be careful when decorating with an open flame. Cut the bottom off a pumpkin, and remove the seeds and pulp. Place the leaf template in your desired spot, pin in place, and then trace the design onto the pumpkin with a pencil. Using a pumpkin-carving tool, cut out the traced leaf design. Cut pieces of yellow vellum, and pin them to the inside of the pumpkin over the leaf openings. Add a battery-operated candle. Use a glue gun to adhere glass florist beads to a clear jar, pressing them to the inside. Bend and twist wire around the jar's rim to form a handle.